TGP has just drawn my attention to the rise of the influence of Evola in Hungary. My idea of society and people was formed and developed by such great thinkers as Schopenhauer, Nietzsche, Mircea Eliade, Rüdiger Safranski, Konrad Lorenz or the all time favourite, Master Eckhart. But If I had to define the category to which my thinking and my perception belong to it would have to be the following: traditionalist. Here I should emphasize Béla Hamvas, Julius Evola and René Guenon. Béla Hamvas (1897-1968) was the Hungarian writer, journalist and librarian who introduced Traditionalism into Hungarian circles before the Second World War. 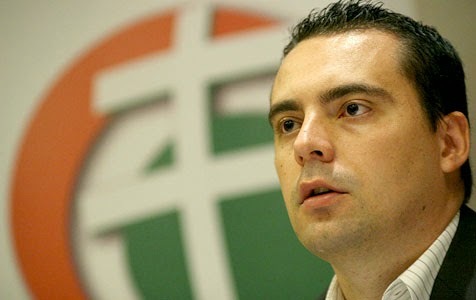 It is unclear what influence Evola has within Jobbik, and it can be assumed that few of the million Hungarians who voted for Jobbik at the last election have read him. But Vona bases his assessment of Islam on a Traditionalist analysis, and this analysis has policy consequences, with Jobbik for example taking a determinedly pro-Palestinian stance, and Vona happily visiting Turkey as well as Russia. He was in Moscow at the invitation of Alexander Dugin in 2013, and is a staunch supporter of Dugin's Eurasianism. Commentators are unsure how to describe Jobbik, with the British Guardian for example reaching for labels like "Fascist" and "extreme right." "New Right" seems a better label. The Manual for Nationalist Youth was published by Kvintesszencia Kiadó, a publisher run by Tibor Imre Baranyi which now has 19 Traditionalist titles in Hungarian: 6 by Evola, 6 by Guénon, 2 by Schuon, and 5 by Hungarian Traditionalists (2 by András László, 2 by Tibor Imre Baranyi himself, and 1 by Róbert Horváth). András László (b. 1941) was the successor as Hungary's leading Traditionalist to Béla Hamvas; Róbert Horváth is a younger Hungarian Traditionalist.